When I asked my five year old (aka Lil Man) what my workout of the week should be for my blog post, he said "How bout them yoga poses you've done all those days." He's been my photographer for the last month with the #newyearmoreyoga challenge where I did a different yoga pose each day. So I decided to take his lead and make yoga this week's workout of the week. Why do yoga? This takes me back to one of my previous posts of Yoga It Really Does Make A Difference. I can see and feel the difference in how my joints and muscles feel. And for those of you who can't get to a local studio or gym who offers yoga, you can find plenty of videos online. I can't tell you the names of the poses. 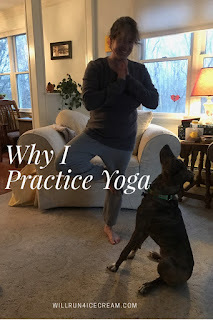 And I modify often, but what I can tell you is that for me yoga does make a big difference in how I feel with regards to soreness and even my stress level. One thing I can say is listen to your body. Just because you could go deeper into a pose one day doesn't mean that you will be able to today. That was a learning lesson for me, and at first a source of frustration. Then I realized, it's about listening to your body, and honoring your body in that moment in that time. Now, I get it, and I enjoy yoga so much more after I had that aha moment. I like this injury prevention one and I often combine it with others if I have time. And although I haven't tried this yet, I do hear that Yoga With Adrienne is great also. I found out about her through an Instagram challenge. And I do plan to check it out. She has a lot of videos to choose from! If you have any favorites, please leave me a message in the comments section. I'd love to check them out. So, there you go... the workout this week is yoga.... courtesy of Lil Man. Definitely check out Yoga With Adrienne - she is terrific! I'll take a look at the injury prevention video you posted; I'm all about that these days. Thanks. Yes, I hear she's great! I'm a member of Yoga Download. It's around $100 a year, but you get unlimited downloads of their videos/audios. I especially love the audios, because once you know most of the poses, you can focus on your practice and not have to look at a screen. I practice yoga for so many reason. I actually started my practice to help with my anxiety after my Crohn's Diagnosis. Now I practice it for mental health, injury prevention, and overall physical health! I can definitely tell when I don't do it.